Although Venus has been called Earth’s sister due to the similar size of these two worlds, the planet that appears most earthlike at its surface is undoubtedly Mars. A solid, rocky world, Mars is just over half the size of Earth in diameter. It appears as a vivid red star in our nighttime sky, giving rise to its nickname, the Red Planet. This is no illusion. The surface of Mars is composed of oxidized compounds of iron—essentially rust. This amazing planet has properties that both challenge secular ideas and confirm biblical creation. Its similarities to Earth make it a tempting target for enthusiasts of space colonization; however, the stark differences between the two planets should dampen such enthusiasm. Geologically, Mars has features strikingly comparable to those on Earth. With mountains, valleys, canyons, volcanoes, and polar ice caps, Mars even has some weather similar to Earth’s, including seasons, clouds, fog, wind, dust storms, dust devils, and occasional frost. Although liquid water is not found in any abundance on Mars, scientists have discovered substantial quantities of water-ice near the poles and water vapor in the Martian atmosphere. Even the axial tilt and rotational period of Mars is much the same as that of Earth. Mars takes 24 hours and 37 minutes to rotate once on its axis—almost identical to Earth.1 Future visitors to the planet might find this slightly longer day enjoyable. They could sleep a half-hour longer compared to their friends on Earth, and it would never “catch up” with them. The sun would appear slightly smaller than it does on Earth and would shine at only half the brightness since Mars orbits farther from the sun. As a result of this larger orbit, the Martian year equals 1.9 Earth years. With a thin atmosphere composed mainly of carbon dioxide, Mars does not provide a breathable environment for humans. In order to survive, future astronauts would have to wear spacesuits with built-in oxygen supplies when walking on the Martian surface. The spacesuits would also need to provide the atmospheric pressure and temperature necessary for human life. Because the force of gravity is only 38 percent of that on Earth, walking on Mars would take some practice. By comparison, the astronauts on the moon experienced a force of gravity only 17 percent of what is normal on Earth. In the daytime, visitors on Mars would experience a bright sky, though not as bright as Earth’s. The color of the Martian sky is interesting, complex, and often blue for exactly the same reason that Earth’s sky is blue: The molecules in the atmosphere scatter shorter wavelengths (blue) more readily than longer wavelengths (red). But the Martian sky is a deeper, darker blue—partly because there is less sunlight than on Earth and also because the atmosphere is much less substantial. When wind kicks up fine dust from the planet’s red surface, the Martian sky can also appear to be orange. Due to sharing a similar axial tilt to Earth at 25.2 degrees, Mars also experiences four seasons. Observers on the planet’s surface would see the sun high in the sky in summer and low in the sky in winter and would experience the same amount of sun exposure as they would at comparable latitudes on Earth during these seasons. Seasons on Earth result from axial tilt, not the changing distance to the sun caused by Earth’s slightly elliptical orbit. This is also true for Mars; however, the orbit of Mars is significantly more elliptical than Earth’s, which causes its distance from the sun to change, affecting the severity of its seasons. So, even though, like Earth, Mars is closer to the sun during its northern hemisphere winter and farther away during its northern hemisphere summer, the effects are different. Its greater distance to the sun partially compensates for the increased duration and direct angle of sunlight experienced in northern hemisphere summers. And while Earth’s elliptical orbit barely affects the extremity of its seasons, the elliptical orbit of Mars causes seasons to be less extreme in its own northern hemisphere than in its southern hemisphere. In addition, Mars has polar ice caps that are visible from Earth using a small telescope.2 These ice caps grow during the winter in their respective hemispheres and shrink during the summer—just like the ice caps on Earth. But Earth’s ice caps are water-ice, and Mars’ ice caps are mostly water-ice layered underneath several feet of frozen carbon dioxide (dry ice). Mars is flat—very flat. Most of its surface resembles the deserts we have on Earth, with rocks as far as the eye can see and very little relief. Though there are hills and even enormous mountains, they have gentle slopes that make them seem less magnificent than peaks on Earth. For example, Olympus Mons is a massive (extinct) Martian volcano and is actually the largest volcano known to exist—nearly three times as tall as Mt. Everest. Yet, even though its base would cover the combined states of Ohio, Indiana, and Kentucky, a mild gradient makes Olympus Mons seem far less impressive than the rugged slopes of Everest. Several other immense volcanoes exist on Mars, dwarfing their terrestrial counterparts. Most astronomers believe that all of these volcanoes are extinct and that Mars currently has essentially no geologic activity. 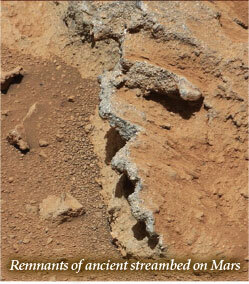 Scientists have been intrigued to learn that the surface of Mars has dry river beds and deltas. Though there is essentially no liquid water on the planet today, evidence clearly suggests that Mars once had surface water. Such evidence is especially perplexing in light of the planet’s thin atmosphere. Water can only exist as a liquid between certain temperatures and under sufficient atmospheric pressures, and the atmosphere of Mars is far too thin to allow water to be liquid for any length of time at any temperature. Heating an ice cube on Mars would cause it to sublime, not melt. That is, the ice would go directly to vapor, bypassing the liquid state entirely. Frozen carbon dioxide behaves in the same way under Earth’s atmosphere. So, was the atmosphere of Mars different in the past? Or was the water released catastrophically, boiling away almost immediately? Could volcanic eruptions increase the atmospheric pressure locally to the point where liquid water could exist temporarily? These are mysteries that remain unsolved. It is noteworthy that secularists are willing to believe in catastrophic, planet-scale flooding on Mars—a planet that cannot support liquid water. Yet, they simultaneously deny the Genesis Flood on Earth—a planet that is 71 percent covered with water. The two moons of Mars are quite tiny compared to Earth’s moon. Phobos is the larger of the two and only about 10 miles in diameter. Since Phobos has so little mass, its gravity is minuscule. In fact, you could pick up a baseball and toss it into orbit around Phobos. And, if you threw it just right, you could turn around and catch it as it completed a loop!5 Deimos is the other Martian moon and has a diameter of only eight miles.6 More like two large boulders orbiting Mars, neither Phobos nor Deimos is spherical. This is common with small moons and asteroids since their gravity is insufficient to overcome the chemical bonds that prevent these bodies from collapsing into a spherical shape. Phobos and Deimos have very circular orbits—both quite near to the Martian surface. Phobos orbits at an unbelievably close distance of only 3,700 miles above the surface—closer than any moon to its planet. To stand on this little world of Phobos and look up at an enormous Mars would be a truly spectacular sight. Its proximity to Mars—combined with Mars’ gravity—means that Phobos orbits very quickly. In only 7 hours and 39 minutes, this little moon can complete one orbit. A greater distance away from the surface, Deimos takes just over 30 hours to complete one orbit. Since Phobos orbits faster than Mars rotates, an observer on the Martian surface would actually see Phobos rising in the west and Deimos rising in the east (albeit very slowly), despite the fact that both moons orbit Mars in the same direction! When taken from a secular perspective, the origin of these moons is perplexing. Were they once asteroids that have since been captured by the gravity of Mars, as many astronomers believe? This is possible but involves an improbable chain of events. Moreover, captured asteroids are expected to have exaggerated, elliptical orbits, but Mars’ moons orbit in nearly perfect circles. As with so many aspects of the universe, the creative diversity of the Lord seems the best explanation for this puzzle. While posing a challenge for natural processes, the creation of unique moons in well-designed orbits is no problem for God. Outer planets (those beyond Earth’s orbit) are best viewed through a telescope when Earth passes between them and the sun. This is because the outer planet is about as close to Earth as it can be, is fully illuminated by sunlight, and is high in our sky around midnight when the sky is darkest. During such a configuration, the outer planet is said to be in “opposition” because it is opposite the sun. But most outer planets still appear large and bright even when they are not in opposition, which happens about once per Earth year. Mars is the exception to both of these generalities. Because it is so small, the planet only looks bright (and large in a telescope) for a month or so around opposition. And unfortunately, because its orbital period is nearly twice as long as Earth’s, Mars’ opposition only happens an average of once every 2.1 years. So don’t miss it.7 During opposition, Mars comes very close to Earth, which is why it looks so good, appearing in a telescope seven times larger and 50 times brighter than it does when on the far side of the sun. By contrast, Jupiter always looks about the same size and brightness, whether in or out of opposition, because it is a large planet and is only slightly closer to Earth at opposition than at other times. Additionally, it is only when Mars is near opposition that the moons Phobos and Deimos are visible under good, dark conditions with a moderately sized backyard telescope. Even then, it can be a challenge. The problem is not so much that these moons are faint—backyard telescopes can resolve stars significantly fainter—but that they are so close to Mars, which is 200,000 times brighter and covers them under its glare. The best way to see Phobos and Deimos is to move the telescope so that the moons are within the field of view and Mars is just beyond it. Mars and Earth possess great similarities but also vast differences. This is yet one more mark of the creativity of the Trinitarian God of Scripture. God Himself (Father, Son, and Holy Spirit) embodies a multitude of characteristics—diverse and yet unified. In the same way, the planets, while not one-and-the-same, have unique variations representing the all-encompassing, endless ingenuity that the Creator exemplifies in all His forms. Indeed, the evidence of Him is clearly seen by what He has made—“even His eternal power and Godhead” (Romans 1:20). This is the sidereal day. By contrast, the solar day on Mars (sunrise to sunrise) lasts 24 hours, 39 minutes, 35 seconds. Only one ice cap is visible at a time—whichever pole is tilted toward Earth at the time. There is also a large valley on Mars called Hellas not far from the South Pole. This valley often fills in with fog, making it appear quite bright. Amateur astronomers often mistake Hellas for one of the polar ice caps because they appear very similar. But Hellas is not exactly at the South Pole and therefore rotates with the planet. If a telescope reveals what seem to be two polar caps, rest assured that one of them is the northern polar ice cap and the other is Hellas, not the South Pole. The valley is named after the Mariner 9 spacecraft that discovered it. Although there is abundant evidence that liquid water once existed on Mars, most astronomers believe that Valles Marineris Canyon was caused primarily by a tectonic crack rather than water erosion. You would have to throw the ball in a direction horizontal to the surface at a speed between 17.9 and 25.3 miles per hour in order for it to orbit Phobos. At speeds less than 17.9 miles per hour, the ball would fall to the surface before it reached you. At speeds greater than 25.3 miles per hour, the ball would escape the gravity of Phobos—never to return. The names Phobos and Deimos mean “fear” and “dread” (or “terror”) respectively. In Greek mythology, Phobos and Deimos are the twin sons of Ares (Mars), who was the god of war. The next opposition of Mars will occur in early April 2014. It also led to a popular Internet hoax that still circulates. The hoax claims that Mars will come so close to Earth this August that it will appear as large in the sky as the moon. Of course, this could never happen since the orbits are too far separated. The hoax is a distortion of an accurate prediction made in 2003 that Mars would appear (that August) as viewed through a telescope at 75 times magnification—just as the moon does without such magnification. Somehow, the part about the telescope was dropped, as was the year date of 2003, so every year people get an erroneous email claiming that they will see Mars as large as the moon. Cite this article: Jason Lisle, Ph.D. 2013. The Solar System: Mars. Acts & Facts. 42 (11).